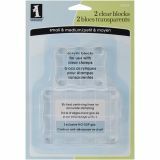 Inkadinkado Clear On Clear Acrylic Blocks 2/Pkg - INKADINKADO-The Clear on Clear System makes stamping easy! Stamps and blocks are crystal clear so you can see where you are stamping. 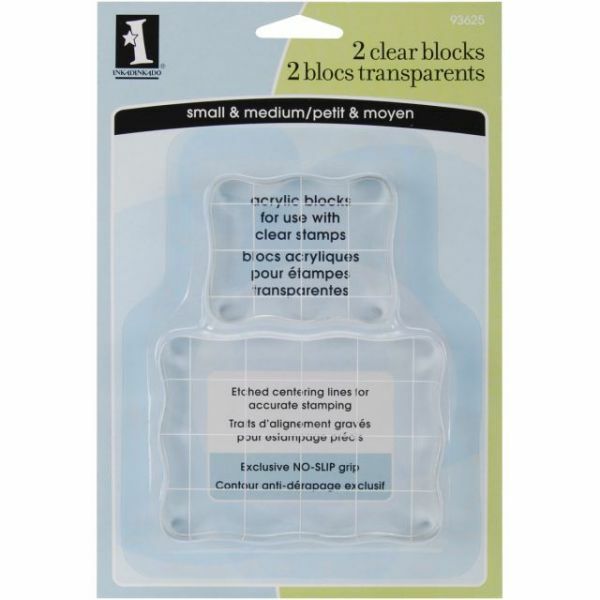 Stamps cling like magic, easy on, easy off--no adhesive and the blocks have wavy edges for a no-slip grip. Each set is themed with stamps that you can use individually or together. Create unique cards, gift wrap, tags, fun accents for scrapbooking, and more! Each stamp set includes 2 storage sheets that hold your stamps, then fit neatly inside the plastic package sleeve. Store in a standard small ring binder. A simple soap-and-water washing of the Stamp and Block will restore their clingability. Approximate sizes of the blocks are smaller size: 2-1/4x1-3/4 and larger size: 3-1/2x2-1/2.